Hey guys and happy Thursday! 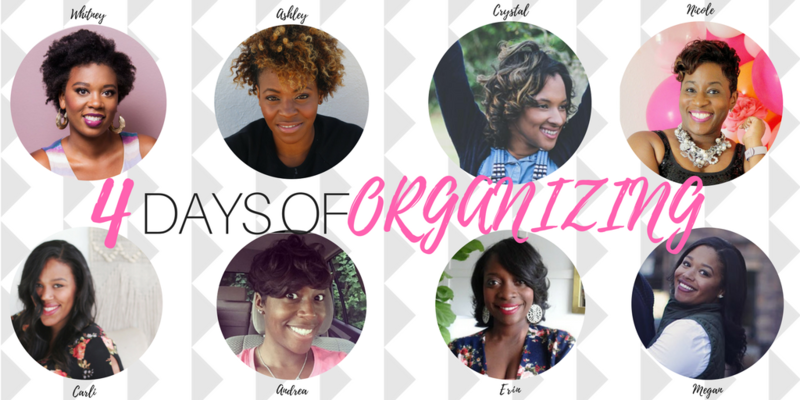 Thanks for stopping by today for my #4daysoforganizing post. If you are visiting me from The Holliday Collective, then welcome!! I hope you’ve been enjoying the 4 Days of Organizing. 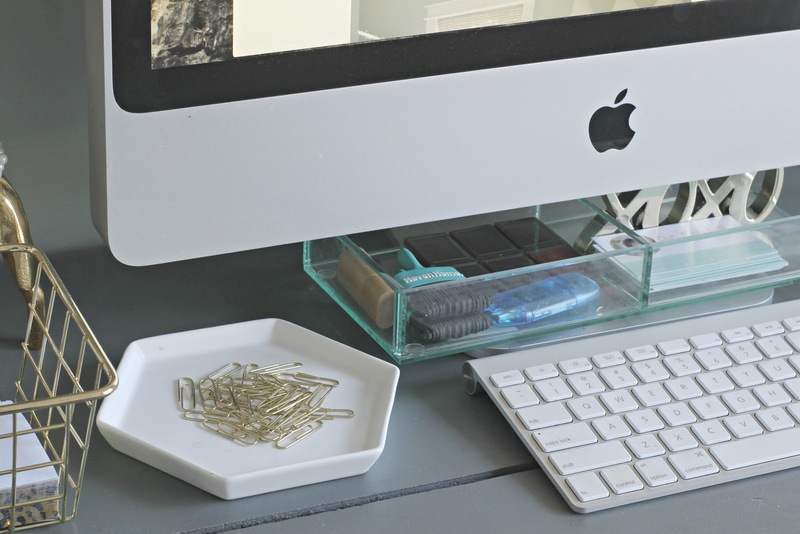 So let’s talk office organizing. I’d like to think of myself as a practical organizer. I don’t buy too much pretty stuff or try to organize in a way that makes me and my family feel things can’t be touched, BUT, I do love when everything has a place. This is the case with my home office. I love that everything on my desk has a place. 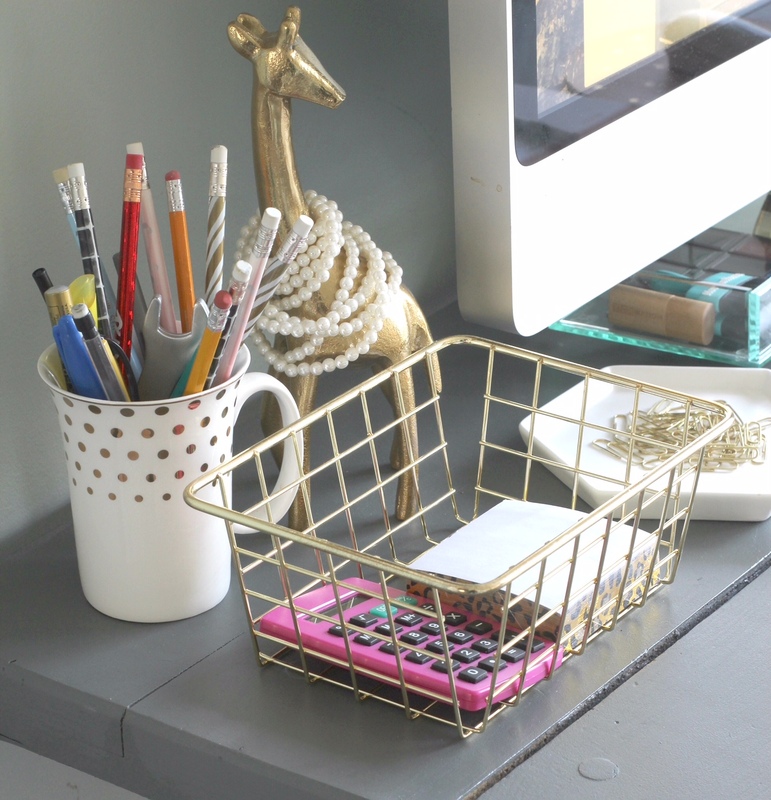 I like to keep my extra paperclips on a small white dish for easy access, along with a small gold basket that holds my extra post-it-notes and calculator (for budgeting). Holding my pens, I use a simple gold and white polka-dot coffee mug. Under my computer monitor, I have a glass organizer that holds business cards and my stash of thumb drives. On the other side, my stapler and tape dispenser. 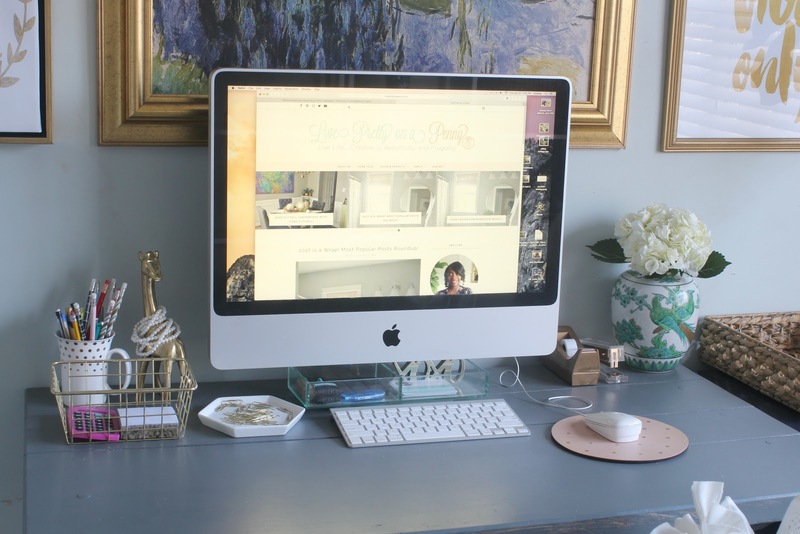 I opt for a pretty clear and neat desk so that everything is within plain site and easy to access. I got these shelving units from Ikea. They add the perfect visual aspect to the room. Since I don’t have any drawers on my office desk, the baskets hold most of the clutter that I need to hide. 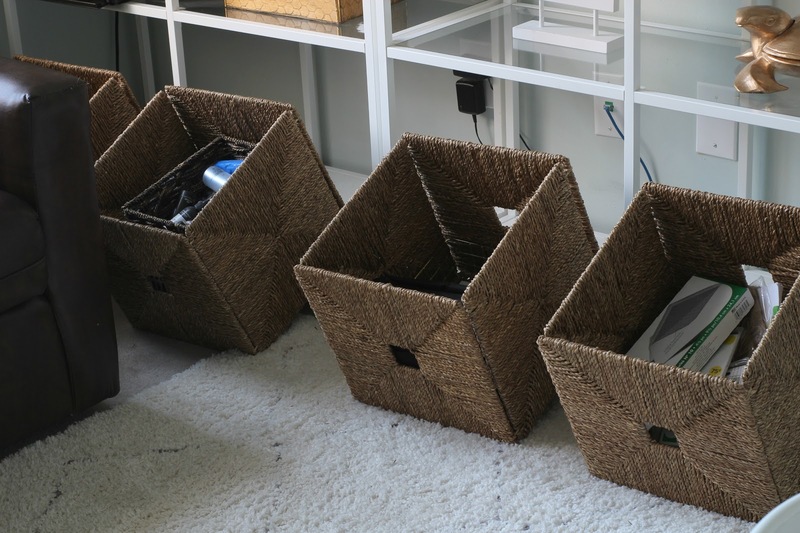 Each basket holds something different. The two baskets to the left hold makeup supplies, the third one holds all of my camera equipment, while the last one, I like to call my “junk drawer.” It holds any type of office supply that I don’t want hogging up the space on my desk, or that would normally live in an office junk drawer, i.e. envelopes, staples, printer paper, etc. I picked up this cute glass vase from Goodwill to hold my nail polishes. Practical and cute! I opted for this floral tin bucket to hold my makeup brushes. The tin is propped on two boxes, that hold things like eyelash glue, lash curlers, etc. 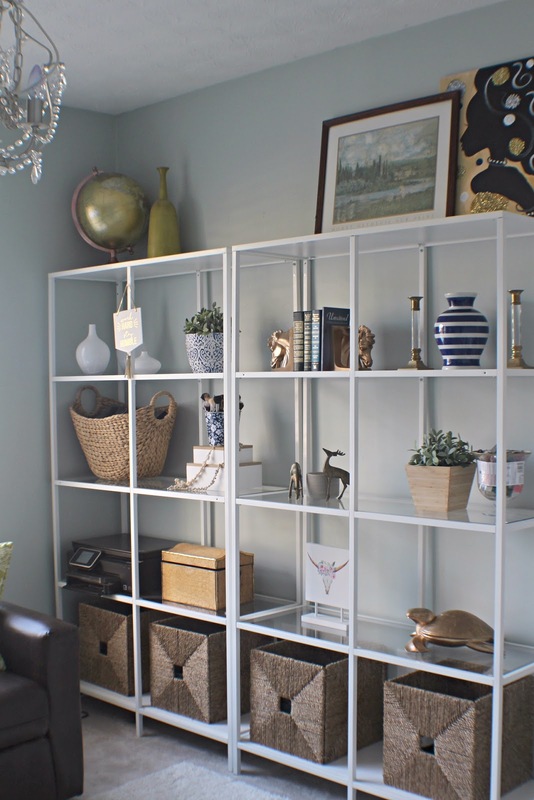 I like the idea of having decorative and practical storage. So that’s it! What do you think? 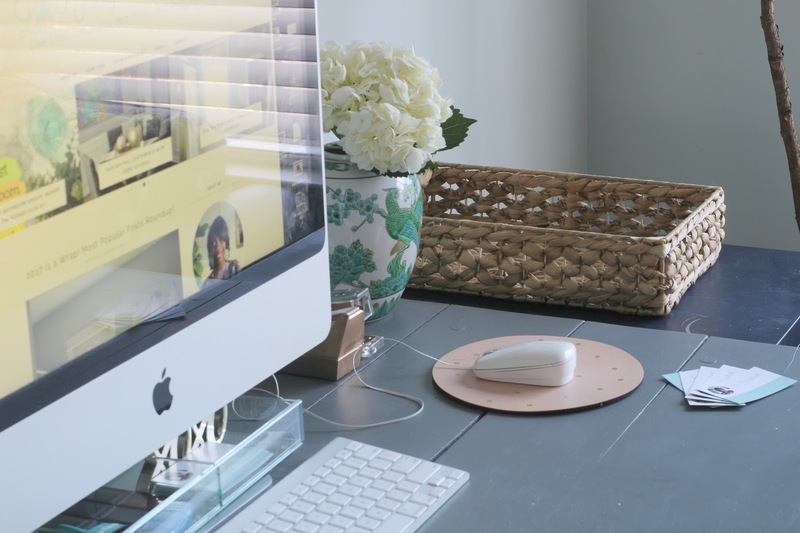 How do you like to organize in your office space? I appreciate you taking the time to stop by. Don’t forget to check out the other ladies along the hop. They are all listed below. Previous Post 2017 is a Wrap! Most Popular Posts Roundup! Oh my gosh everything is so tidy and elegant looking! THIS turned out beautifully! Nice work. 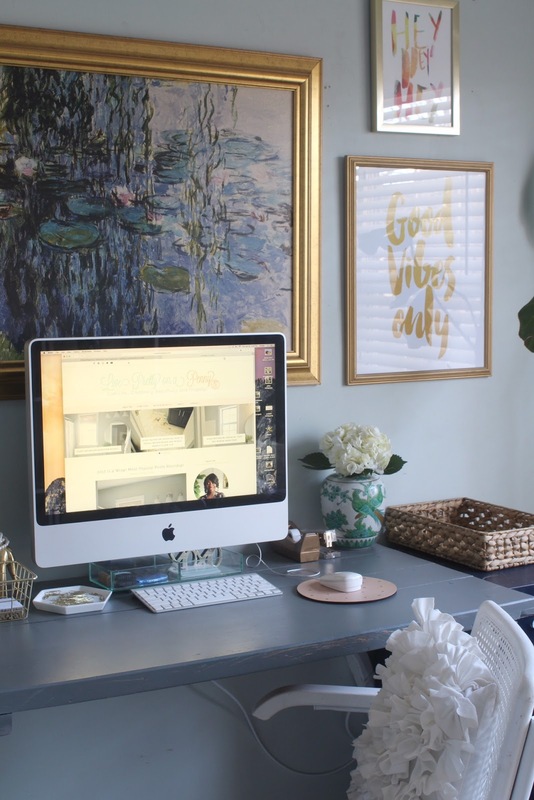 I've been trying to figure out how to properly organize our home office and I think this inspiration was exactly what I needed! 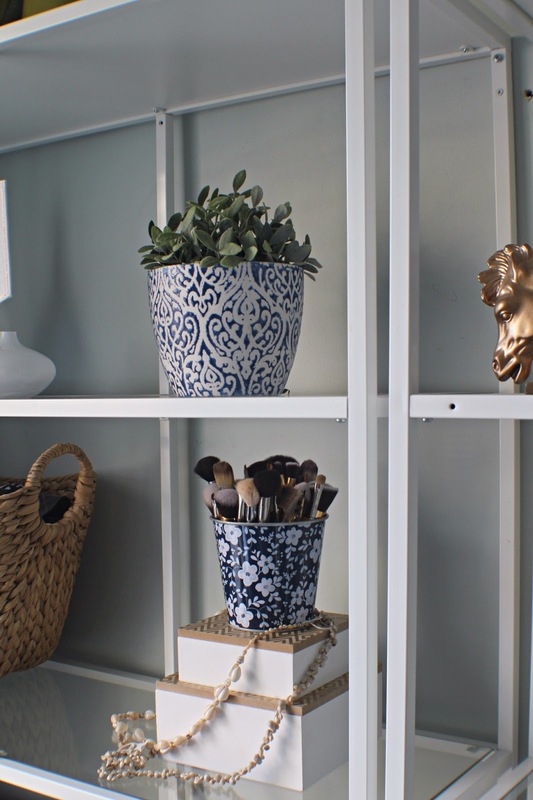 The IKEA shelf is great in your office. 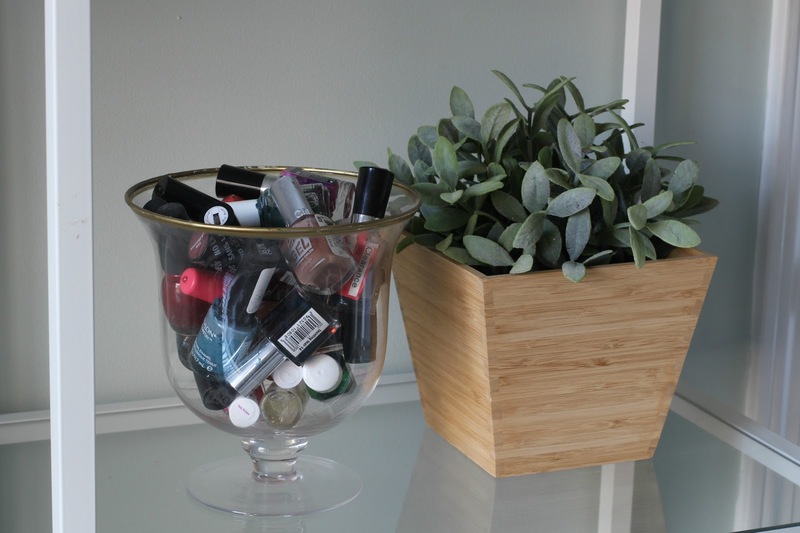 With no drawers baskets serve for storing all your essentials too…love this Erin! I loved how you used second-hand items to store items as well. Great job Erin! Looking forward to collaborating with you again real soon! Thank you Crystal! Can't wait to collaborate with you again! I've always loved your office, Erin! It always look so good. I love how you use the baskets at the bottom of your bookcases for corraling stuff that I know can cause a lot of clutter.